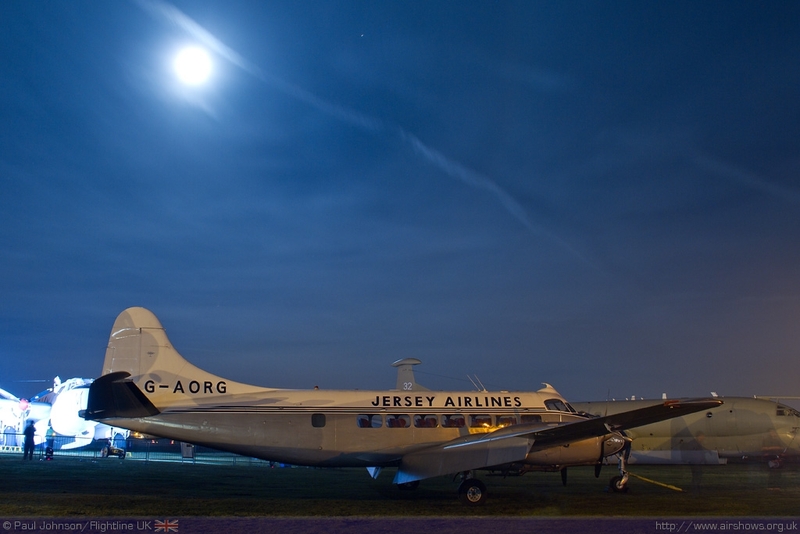 The long cold December nights are the perfect time for night-shoots. 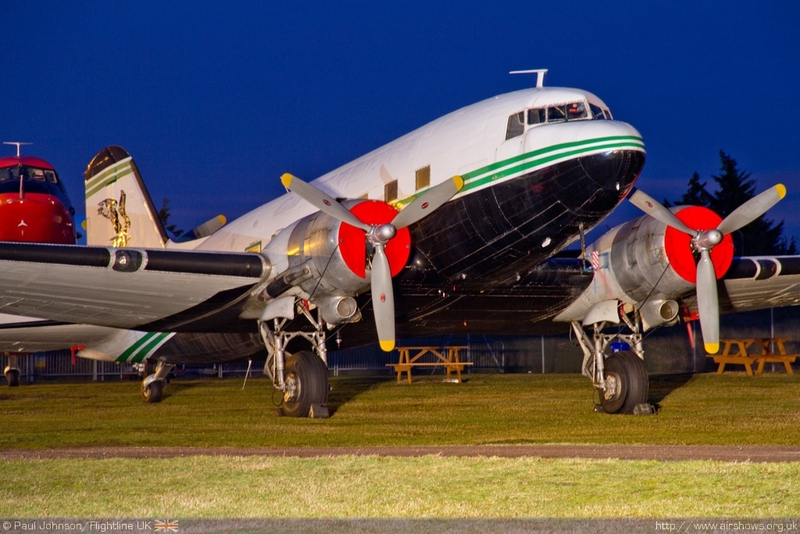 The 10th December saw a superb event held by the Air Atlantique Classic Flight at their AIRBASE Visitors Centre at Coventry Airport to complete a bust year of aviation events. 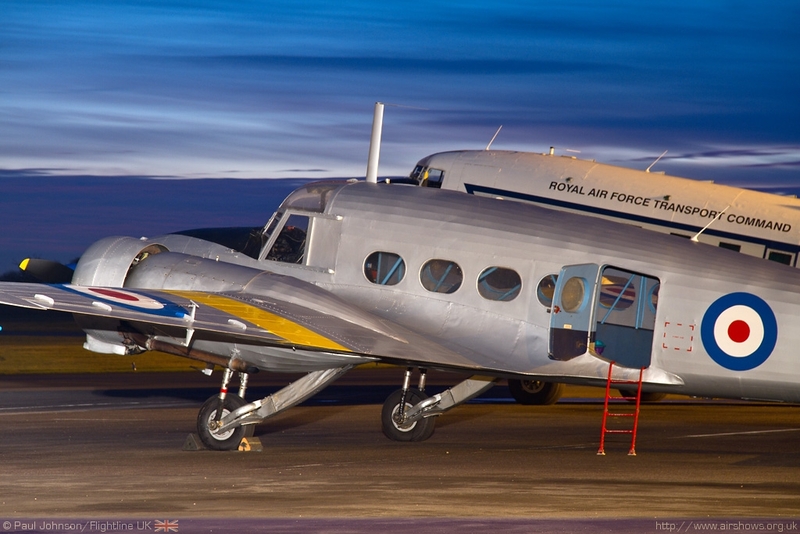 The Classic Flight is home to an impressive collection of military and civilian aircraft, mainly from the post war period of which a number participated in the Evening Engine Runs. 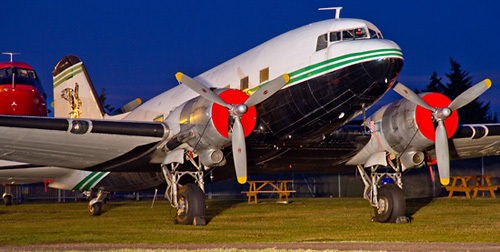 The Air Atlantique Classic Flight is a regular visitor to the UK airshows and they have an impressive collection of historic aircraft. 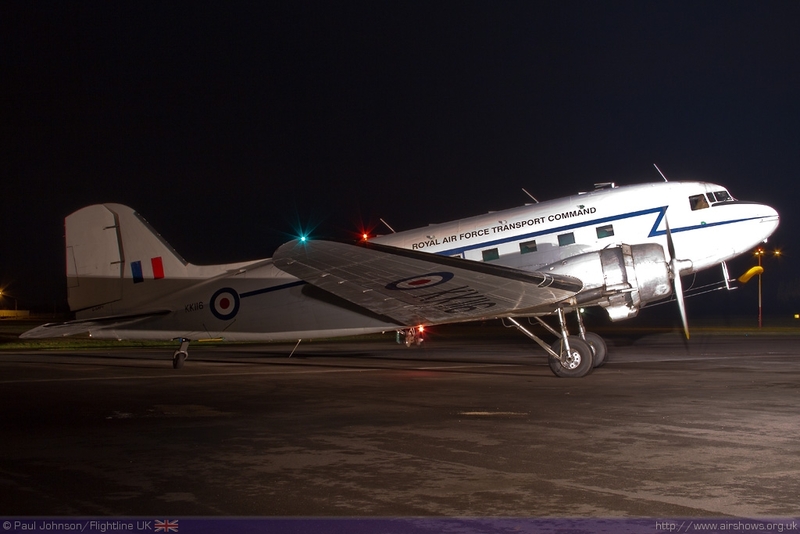 Their Coventry base has become a major tourist attraction under the AIRBASE banner. 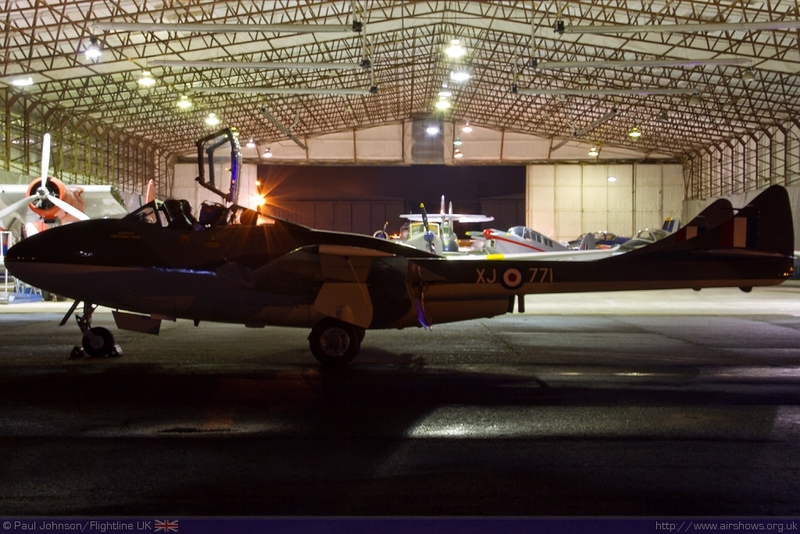 AIRBASE in itself is an impressive attraction. 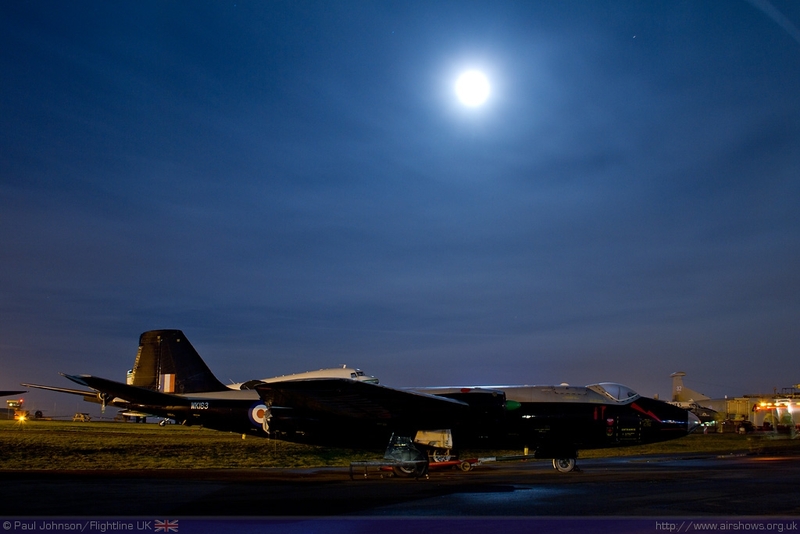 Many of the flights aircraft are on show, even those that are currently grounded due to various different. 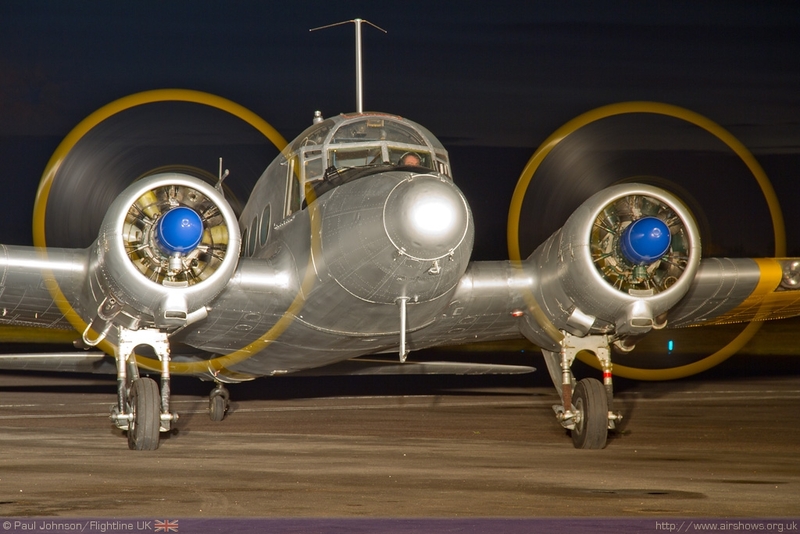 Such aircraft include the Flight’s pair of Canberra B2/6 and T4, the Twin Pioneer and a number of DC-3s. 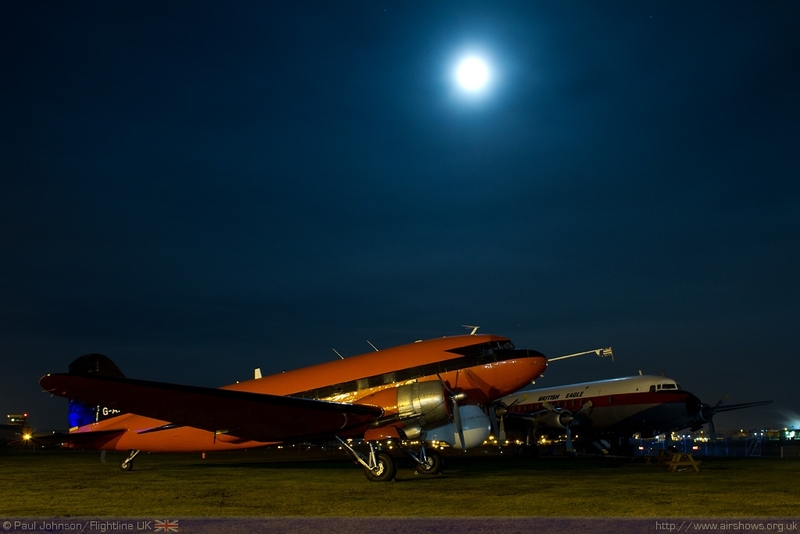 The success of evening events for photographers very much depends on the variations of shots on offer. 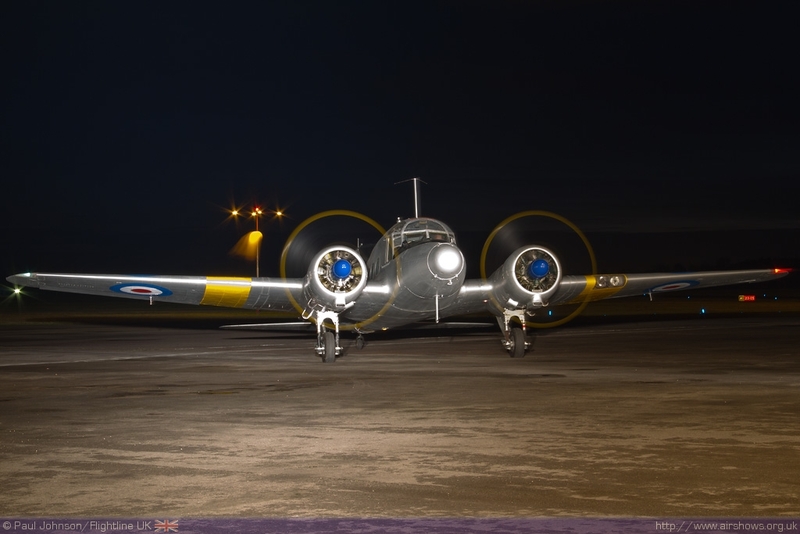 Coventry was superb in this respect; many of the aircraft that were run were taxied in various different ‘poses’ with and without their navigation and landing lights blazing. 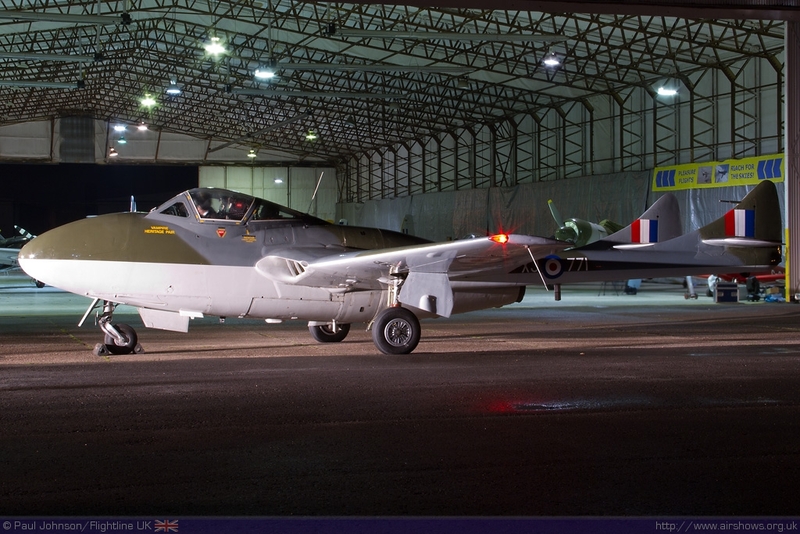 The floodlighting of the subjects is essential and AIRBASE brought in some impressive stage lightning rigs which could be remotely controlled and even coloured filters. For the most part it seemed quite reasonable although at times it may have been a little too strong for some peoples taste. 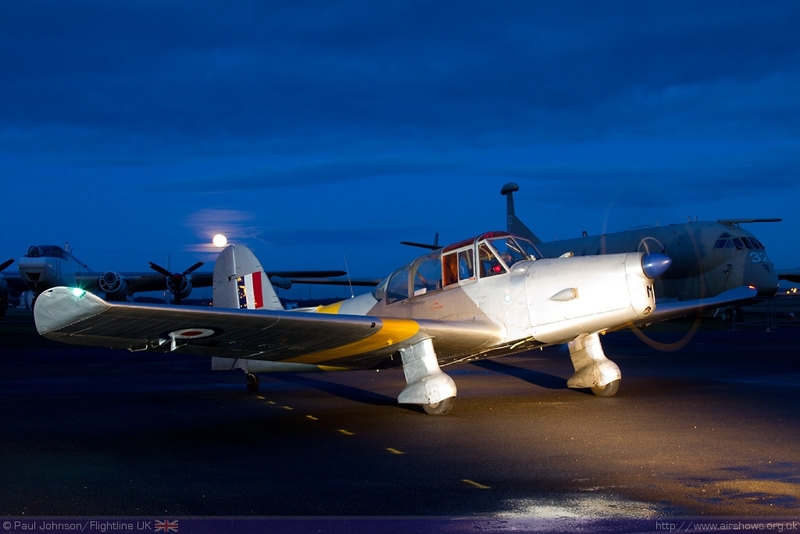 The evening started with some of the Flight’s lighter residents running for the crowds in front of the main hangars. 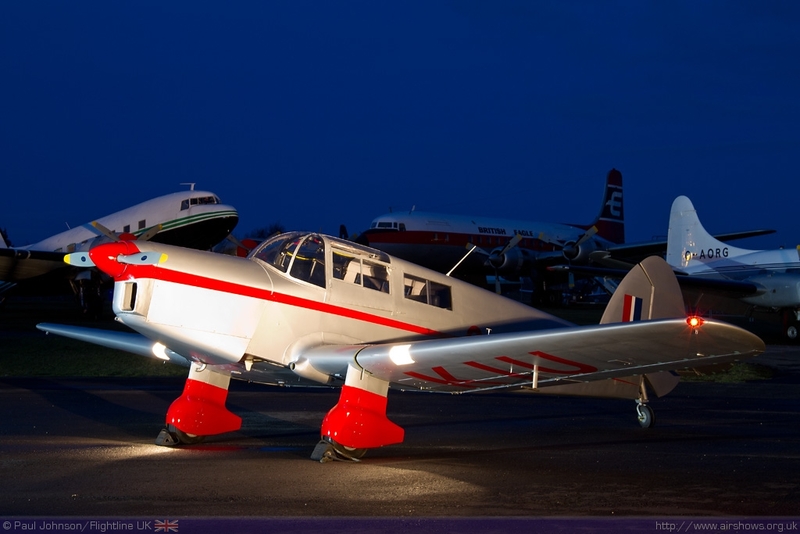 This included the distinctive black De Havilland Chipmunk T10, the Chrislea Super Ace and the Percival Prentice T1. 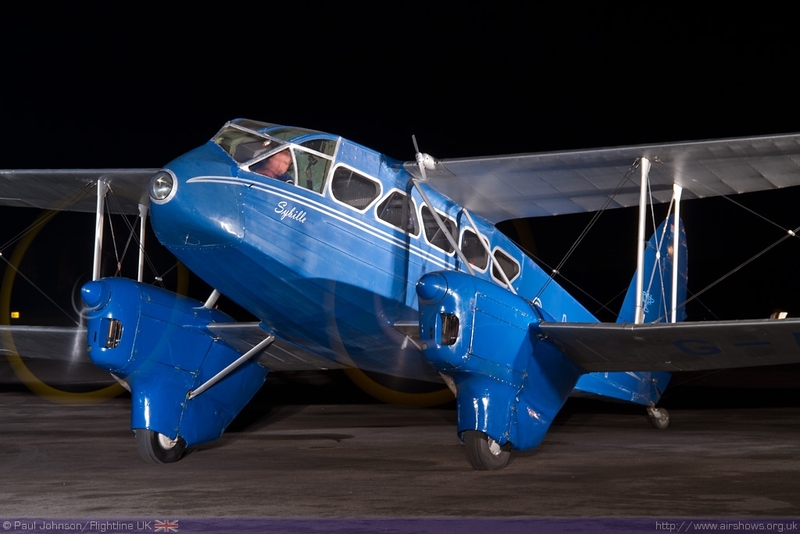 Sadly the Flight’s new Percival Proctor took a dislike to the bitter cold and refused to start. 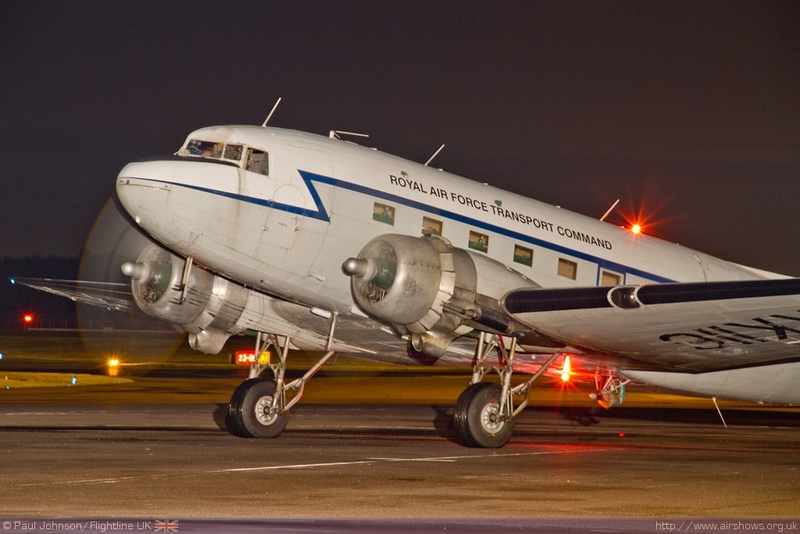 For the Flight’s larger aircraft, the crowd moved on to the airside ramp space to be treated to runs by the Avro Anson T21, De Havilland Dragon Rapide and the Douglas DC-3 Dakota in RAF Transport Command colours. 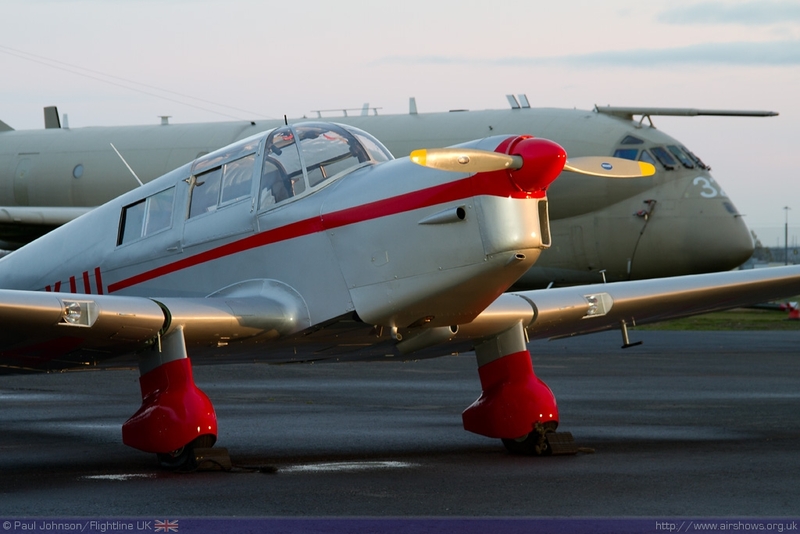 The latter was also equipped with its Oil Spill Spraying Kit. 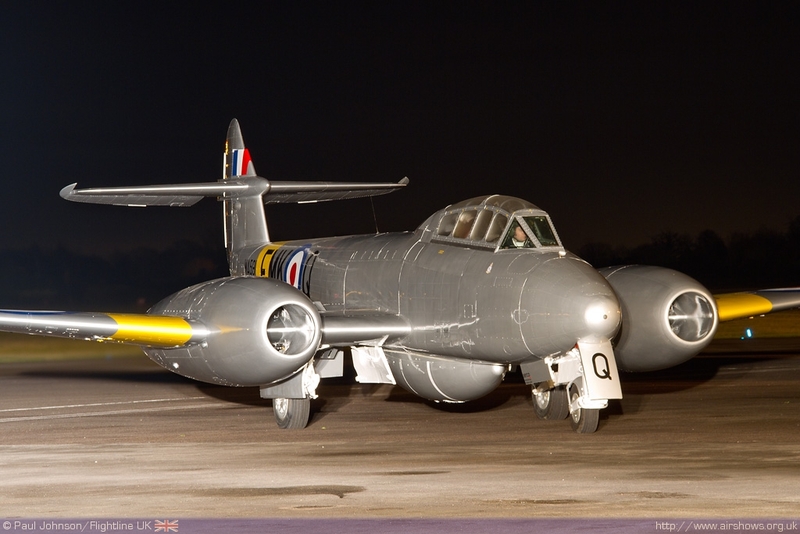 For many though the star of the evening though was the Meteor Flight’s beautiful Gloster Meteor T7. 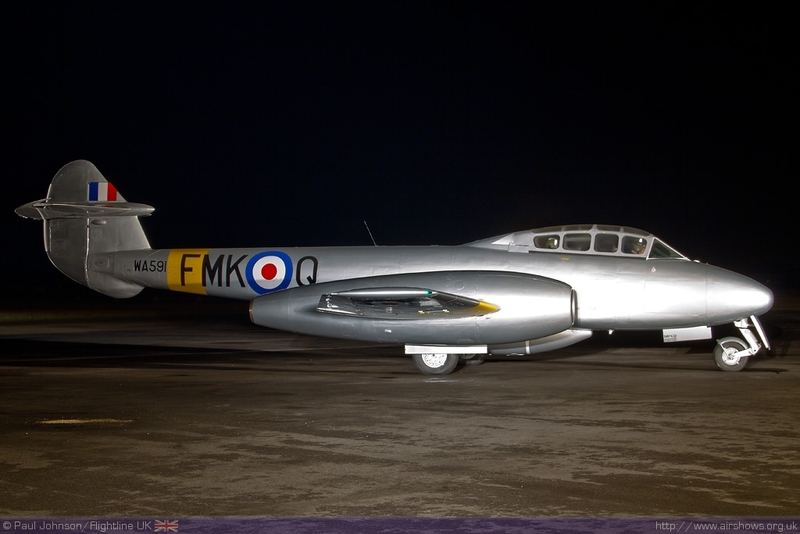 This Meteor conducted its first flights during 2011 and made its own flying display debut at the season closing Autumn Airshow at IWM Duxford October. 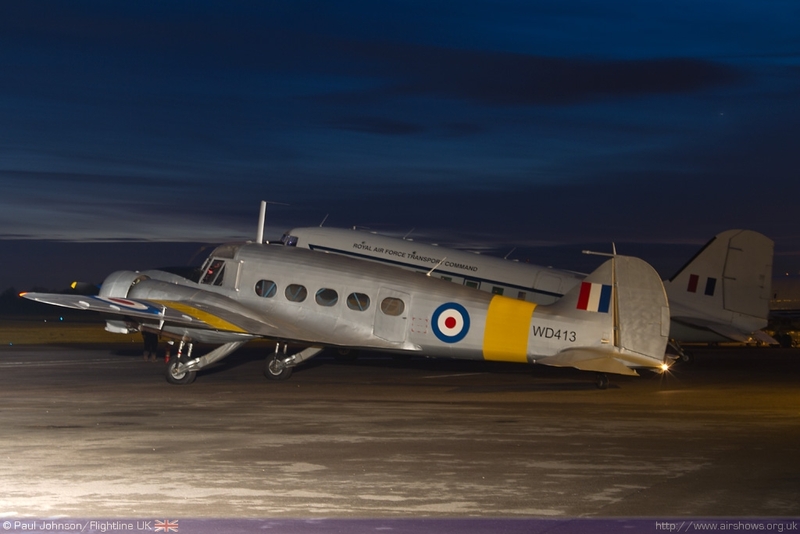 The aircraft wears the traditional all-over Silver with yellow stripes of Training Command and looks absolutely stunning. 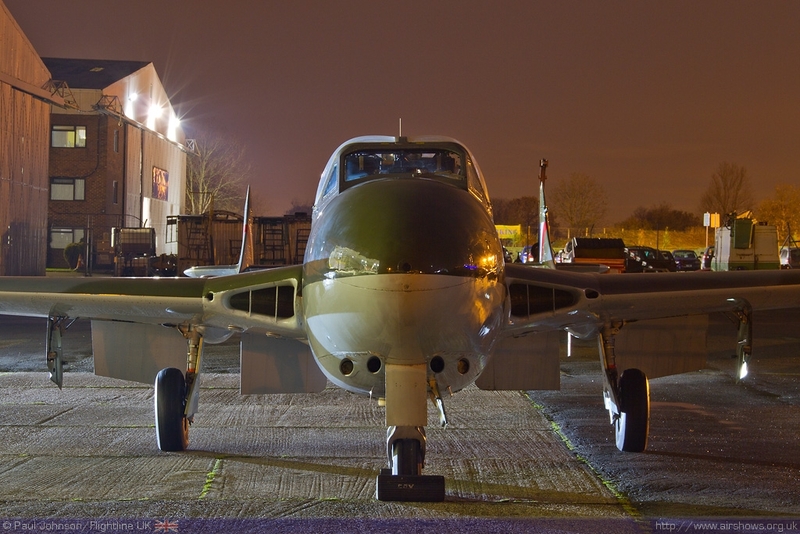 Floodlit and set against the dark backdrop of a nocturnal Coventry Airport the aircraft was a superb photographic subject. 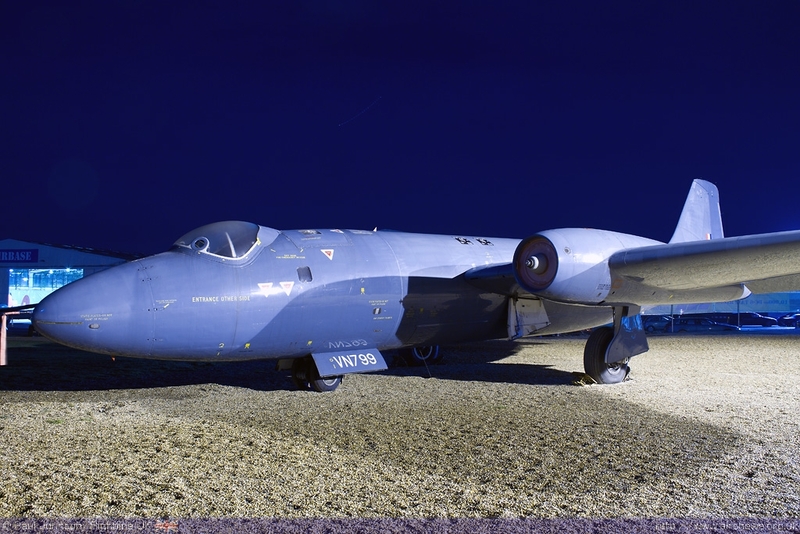 The action then moved back into the Museum grounds in front of the main AIRBASE hangars. 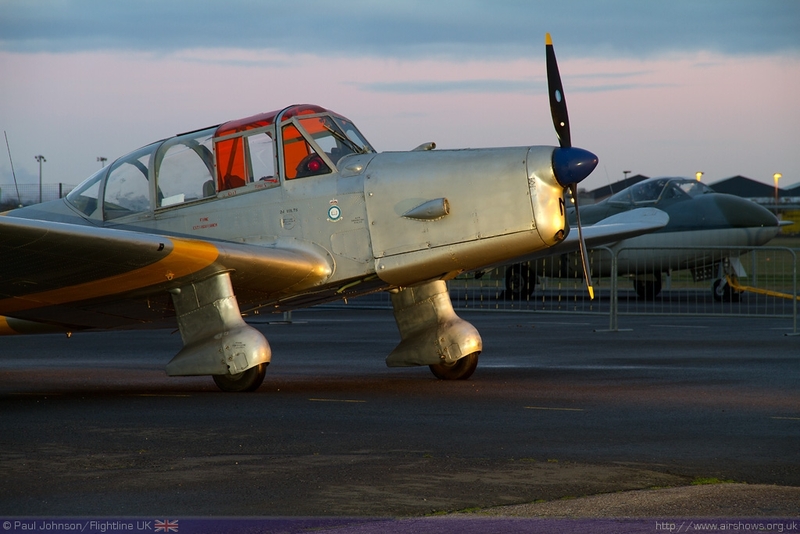 First to perform was the Classic Flight’s de Havilland Vampire T55 which has been absent from the airshow circuit for some time. 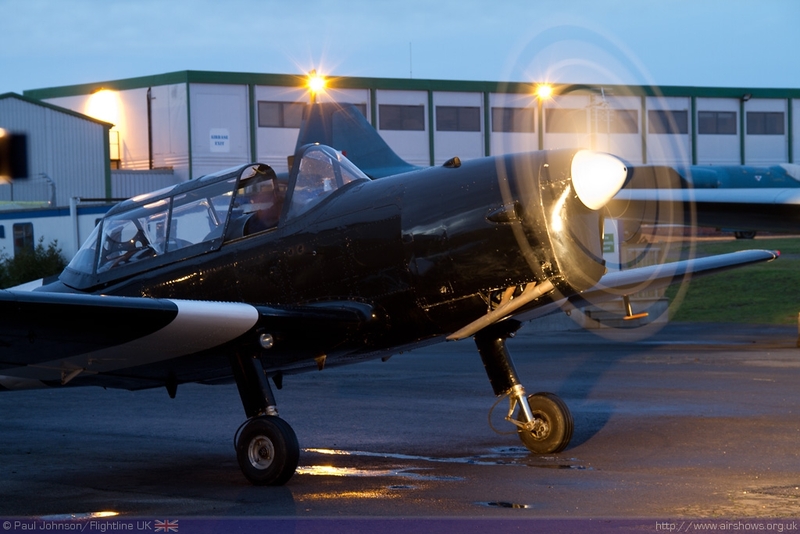 Sadly there were no flames as the aircraft started, but it was great to see the aircraft live again! 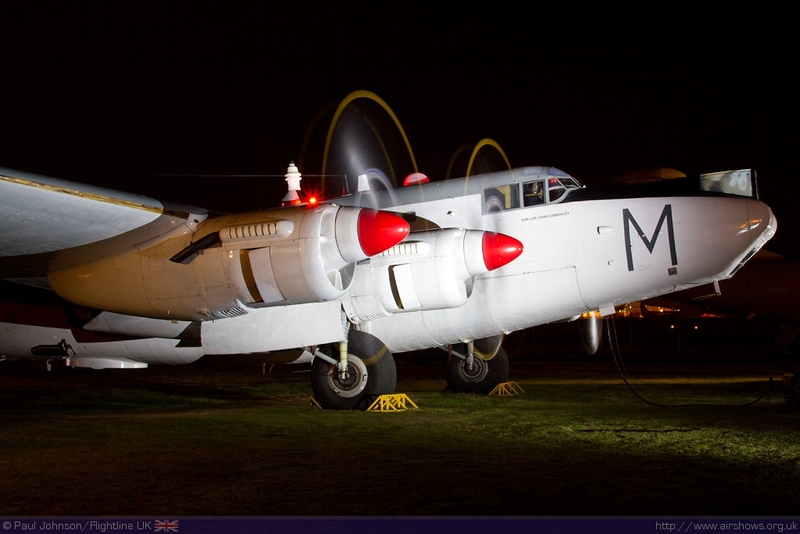 The finale to the engine runs was the superb Avro Shackleton that has been present at Coventry for some time. 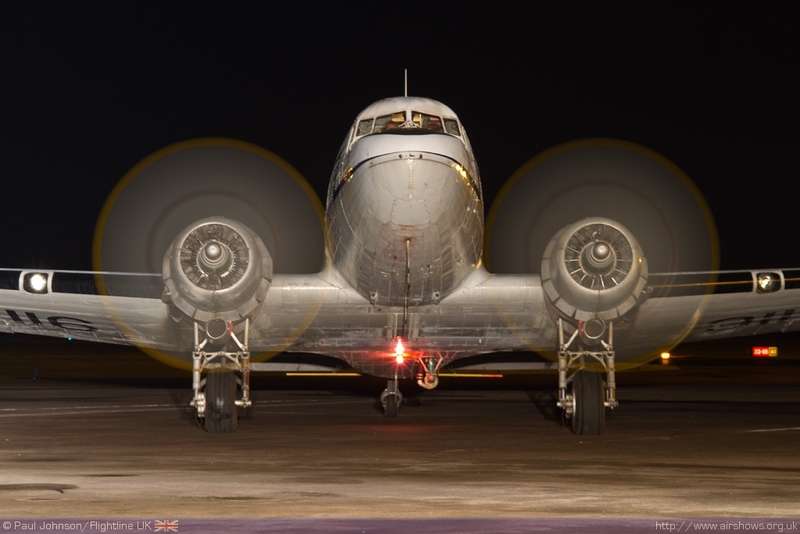 Although only three engines on the big maritime surveillance aircraft were service, the noise and spectacle were a stunning end to the engine runs. 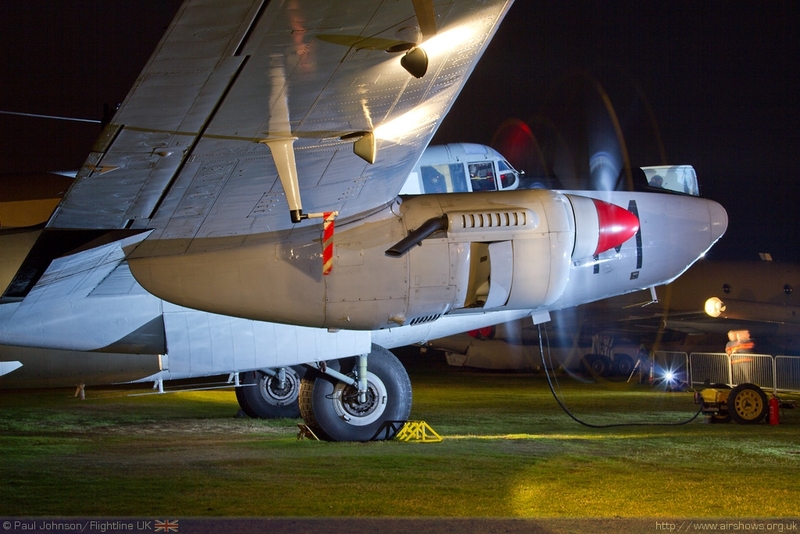 There could not have been a more perfect evening for the Engine runs. 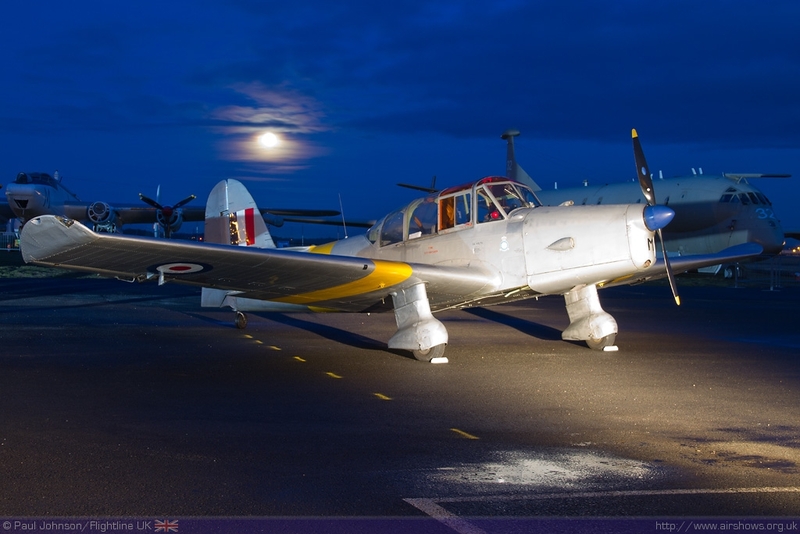 The day’s fair weather continued into the evening with a full moon and some whispy high level clouds to add to the atmosphere. 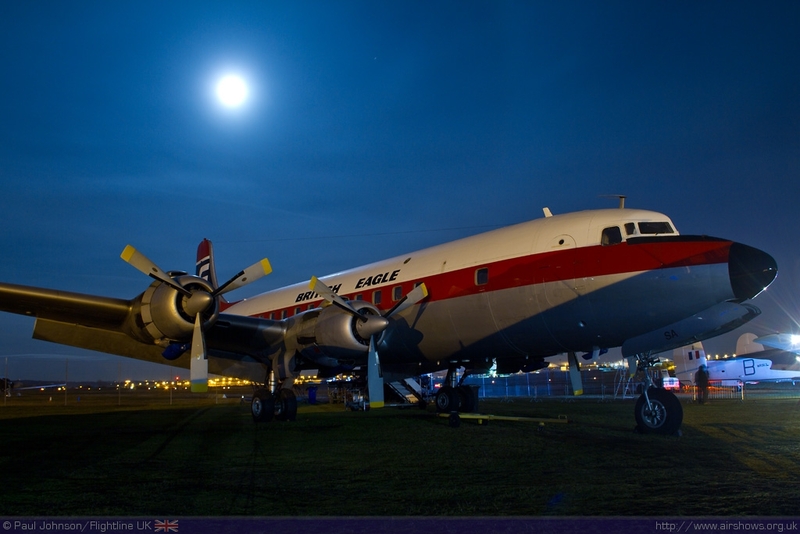 The bright moonlight meant there were plenty of other photographic opportunities of AIRBASE’s other aircraft. 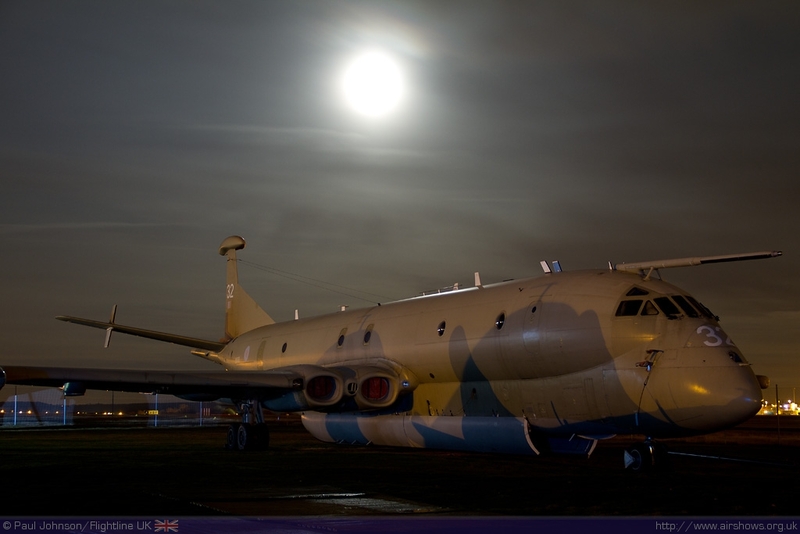 One of the most notable of these was the British Aerospace Nimrod MR2 which is one of the more recent arrivals at Coventry. 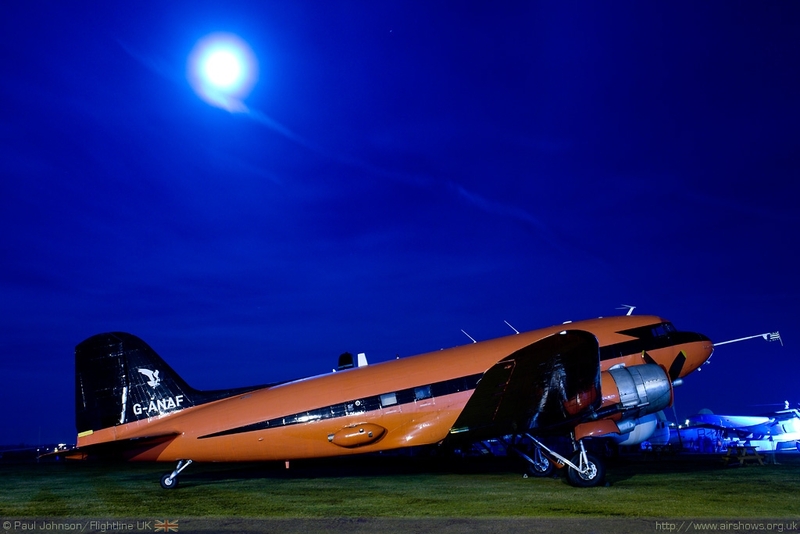 Other great subjects included the beautiful Douglas DC-6 which is rumoured to be returning to flight for 2012, the Jersey Airlines De Havilland Heron as well as the Canberras and DC-3s. 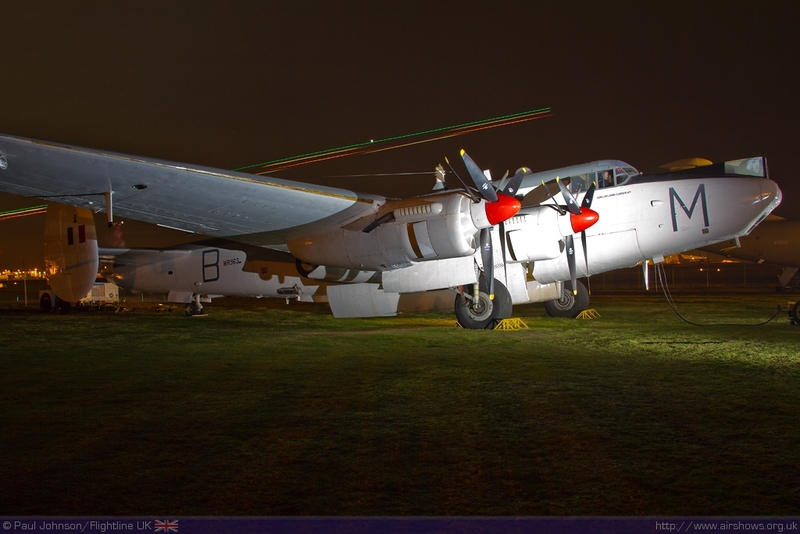 The “AIRBASE Evening Engine Runs” was a superb event. 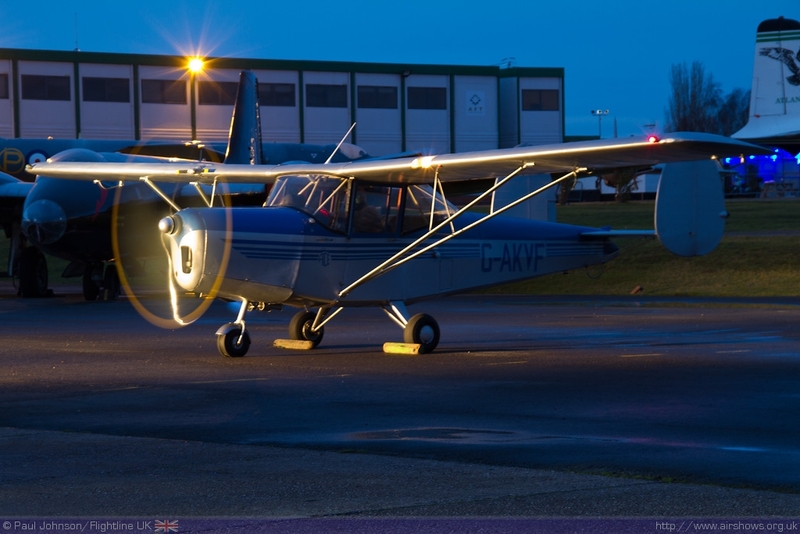 Few other evening photocalls can offer the variety of subjects that the AIRBASE hangars can offer. 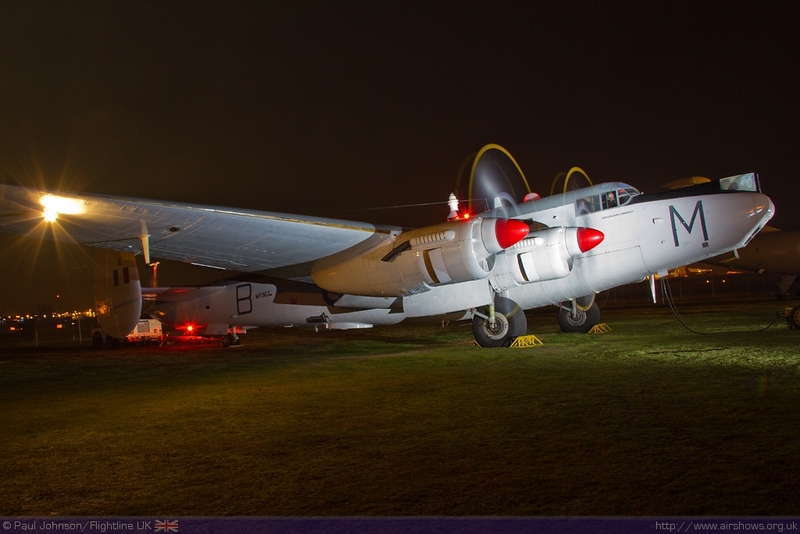 Huge thanks must go to the staff of AIRBASE who kept their shop and café open which was most welcome on such a cold evening as well as the ground crews and pilots who made sure such a diverse collection of aircraft were brought to life for the evening.